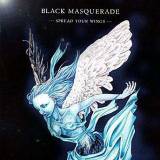 Black Masquerade, led by guitarist/songwriter Yoshihiro Nitta, has become one of the top power metal hopefuls in their home country of Japan. Other countries like Korea have also embraced this band in a big way and their poplarity in those two countries helped sell out all the copies of their first E.P. Another Place, released late last year. Spread Your Wings is the first full length release from these relative newcomers to the power metal scene.